Thanks to the Beach Boys harmonizing about California girls, beach party movies of the ’60s and TV shows like Baywatch, many people think of Los Angeles as palm trees, endless beaches and bikini-clad women. But LA is far more complex. It’s a mix of the old and new, from cuisines to culture to ideas. The creativity and diversity of the region are reflected in the over 100 museums focused on the odd to the divine, vibrant global street art community and constant evolution of the food scene. The City of Angels is also the land of reinvention. Henry Rollins—journalist, punk legend, radio host, spoken word artist and actor—once remarked, “For me, returning to Los Angeles annihilates the memories of where I have just been with an astonishing speed.” Los Angeles County attracts seekers, dreamers, hustlers and wannabe actors/screenwriters/directors. Most come from somewhere else and are looking for something better. A persistent optimism and self-expressiveness permeate the air. As the most populous county in the nation, with over 10 million residents, Los Angeles County comprises 88 cities with more than 100 languages spoken within its 4,084 square miles. The county is larger than the states of Rhode Island and Delaware. The entertainment industry is an integral part of the local economy, annually contributing $47 billion to the region. 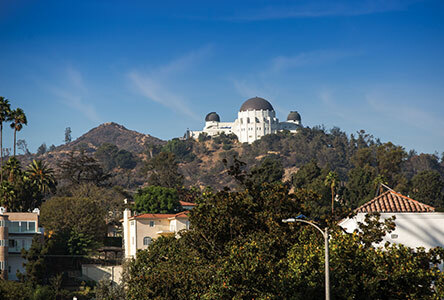 For decades, the name Hollywood has been synonymous with the movie business, but today, most studios have moved into neighboring suburbs such as Burbank and Culver City. Despite its car culture rap, LA County offers lots of outdoor activities. Rent a bike along the Santa Monica Pier and ride down the path that parallels the ocean, through Venice and on to Marina del Rey before doubling back. Pack a picnic lunch and hike Echo Mountain in Altadena or the Arroyo Seco trail system in the San Gabriel Mountains. Sign up for rock-climbing instruction, take a surfing or stand-up paddle boarding lesson from one of the many surfing centers in Santa Monica. Explore the county’s many and varied beaches, from the iconic to the little known, but bring a sweater. In the summer, moist marine air is pulled inland and forms a misty cover till it burns off by the afternoon. Start in Malibu and show your stuff at the iconic “Surfrider Beach” at Malibu Lagoon State Beach and explore tide pools and caves at Leo Carrillo State Park. Perhaps watch filming in progress at Malibu’s Point Dume State Beach, often featured in movies such as the Iron Man series (2008-2013), and it appeared in the last scene of Planet of the Apes (1968). Or look out for California gray whales during their migration from December to mid April. Next, wind your way down through Topanga Beach and stop over for a volleyball game at Will Rogers State Beach in Pacific Palisades. Then hop over to Venice and the Strand on Manhattan Beach to people-watch. Or for something different, head to Long Beach and tour the Queen Mary, a retired ocean liner that sailed on the North Atlantic from 1936 to 1967 and is now a hotel, historical landmark and entertainment venue.